The Kolkata-bound IndiGo flight had taken off from Jaipur. IndiGo flight 6E-237 going from Jaipur to Kolkata made an emergency landing today. A video has emerged of a potentially catastrophic situation during an IndiGo flight from Jaipur to Kolkata last night with 136 passengers onboard. The video, shot by a passenger on his smartphone and shared on social media, shows thick smoke in the cabin of 6E-237, a new jetliner as it approached its destination. A second video shows some passengers evacuating the aircraft on an escape chute once it landed safely. While IndiGo has confirmed the emergency landing, their official statement says there was ''suspected smoke in (the) cabin,'' something contradicted by the new video which clearly shows the presence of smoke. 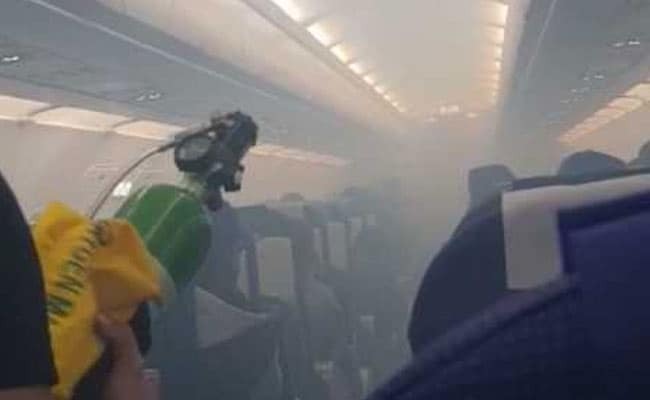 A senior industry pilot told NDTV that smoke onboard an aircraft ''is one of the most serious and life-threatening situations that one can encounter in an aircraft because of the threat of asphyxiation". Oxygen masks, which drop in the cabin of civilian aircraft in the event of a drop in the air pressure, are not designed to completely filter the smoke. That can only be achieved by full-face masks that only pilots in the cockpit of airliners are equipped with. In September 1998, all 229 passengers and crew onboard a Swissair MD-11 were killed off the coast of Canada after the pilots first encountered smoke onboard the jetliner which they reportedly believed emanated from the air conditioning system of the aircraft. An investigation by the Transportation and Safety Board of Canada stated that ''flammable material propagated a fire that started above the ceiling on the right side of the cockpit near the cockpit rear wall. The fire spread and intensified rapidly to the extent that it degraded aircraft systems''. IndiGo, India's largest airline, continues to face troubles with its brand-new fleet of A-320neo (New Engine Option) aircraft with repeated failures and technical problems with its Pratt and Whitney engines. In March this year, the Directorate General of Civil Aviation (DGCA), India's aviation watchdog, had grounded 11 Airbus A-320neo airliners, eight of which belonged to IndiGo. The IndiGo A-320neo, which was involved in yesterday's incident, remains grounded in Kolkata at the moment with airline maintenance staff trying to understand what caused the smoke onboard.